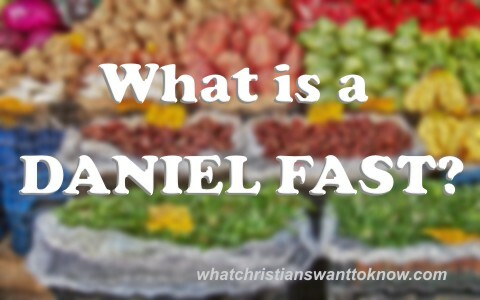 What is the so-called “Daniel Fast?” Is it something good for today? Is there anything “spiritual” about it? The Bible never calls Daniel’s eating experience in chapter one a “Daniel Fast” or even a fast. For one thing, it wasn’t a fast as they ate vegetables (Dan 1:12, 16). When the Jews were sent into captivity, “the Lord gave Jehoiakim king of Judah into [the] hand” (Dan 1:2) of 05, king of Babylon, after which, the king commanded that the cream of the intellectual crop be brought to him so he could use them for his kingdom and to indoctrinate (brain wash?) these young Jewish men into the Babylonian religion and society. They presented these men with a literal king’s feast but “Daniel resolved that he would not defile himself with the king’s food, or with the wine that he drank. Therefore he asked the chief of the eunuchs to allow him not to defile himself. And God gave Daniel favor and compassion in the sight of the chief of the eunuchs” (Dan 1:8-9). There were probably some unclean foods at the feast table and Daniel chose not to defile himself, even if it meant his life, so Daniel said to the chief of the eunuchs, “Test your servants for ten days; let us be given vegetables to eat and water to drink. Then let our appearance and the appearance of the youths who eat the king’s food be observed by you, and deal with your servants according to what you see” (Dan 1:12-13), so it was basically a vegetarian diet. The conclusion was that “At the end of ten days it was seen that they were better in appearance and fatter in flesh than all the youths who ate the king’s food. So the steward took away their food and the wine they were to drink, and gave them vegetables” (Dan 1:15-16). The so-called “Daniel Fast” is not a fast at all; it is a vegetarian diet with water, most likely. Does it make one more Spiritual? Some proponents of the Daniel Fast claim that it’s a powerful spiritual experience that will help followers of Jesus Christ develop a deeper, more intimate relationship with Him. What I would ask is “What chapter and verse do you refer too?” To walk closer with Christ means we are obeying more of His commands because whoever loves Christ will obey Christ (John 14:12-17, 15:10). To please God means to live a life that reflects His Son and glorifies Jesus. It is not what we eat or drink or even fast for. Our diet may make us healthier, but diets cannot draw us closer to Christ in themselves. That is a false claim by many of the websites I visited. They pretend it is biblical and claim that its “spiritual,” whatever that means. Remember that demons are spiritual too! When anyone claims a belief in something found in the Bible and has no Scripture to back up that belief, then that is pure speculation and extra-biblical, since it relies on claims that are outside of the Word of God. Take it for what it is; the word of man and not of God. Are there times to Fast? I believe there are times that we can fast, not to make God do something, but to show God just how serious we are in our affliction or prayer request, however Jesus wanted to make sure we didn’t fast for the wrong reason, like only to be seen by men (Matt 6:16). We are to fast secretly before God and before Him alone Who sees us in secret but will openly reward us someday. That is the very same concept Jesus taught with giving (Matt 6:4). When I had lost my mother years ago, I fasted, not really by choice, because I was so heartsick that I had no desire for food. My grief overwhelmed my sense of hunger. I was consumed by my grief for a time, so in similar fashion, when we are consumed with pleasing God and our desire is for Him more than anything else (Matt 6:33), then you are fasting for the right reason. Even if you don’t fully understand why we fast, when we do, we can see more clearly our utter dependence upon Him for everything; food, shelter, home, family, friends, and above all, Jesus Christ. Hunger humbles us; it makes us weak and so that is when God can be shown to be strong (2 Cor 12:10). Isaiah the Prophet rebuked Israel over improper fasting as they cried out in complaint to God, “Why have we fasted, and you see it not? Why have we humbled ourselves, and you take no knowledge of it” (Isaiah 58:3) but God answers them, “Behold, you fast only to quarrel and to fight and to hit with a wicked fist. Fasting like yours this day will not make your voice to be heard on high” (Isaiah 58:4). Fasting like this gets us nowhere, but fasting in humility, brokenness, and in desperation, can make our “voice heard on high.” God gives them a hint about the problem with this kind of fasting as He asks, “Is such the fast that I choose, a day for a person to humble himself? Is it to bow down his head like a reed, and to spread sackcloth and ashes under him? Will you call this a fast, and a day acceptable to the Lord” (Isaiah 58:5)? I would say the answer to that is no. God tells us “the fast that I choose [is] to loose the bonds of wickedness, to undo the straps of the yoke, to let the oppressed go free, and to break every yoke” (Isaiah 58:6) so we can also fast to overcome a major, habitual, ongoing sin or fast and pray to God to restore or heal a relationship, or bring home a prodigal son, or for help in dealing with mounting health issues, costs, and life in general. I would never recommend a fast until you first talk with your doctor. You may have medical reasons that prevent you from fasting and if your doctor doesn’t recommend it, don’t do it! Diabetics are especially at risk. In that case, you can try a “media fast” for a day where you have no access to any electronic communication device. That means no smart phones, no voicemail, no email, no snail mail, no magazines, no newspapers, no Internet, no tablets, no television or video. Let me tell you from experience; that’s very hard to do but it will certainly draw you closer to Christ because all you are left with is what is most important anyway; the Word of God and Jesus Christ. Previous post: Should Christians Observe Jewish Holidays?